Kalenda holding the 2.89-carat diamond he named after his son. 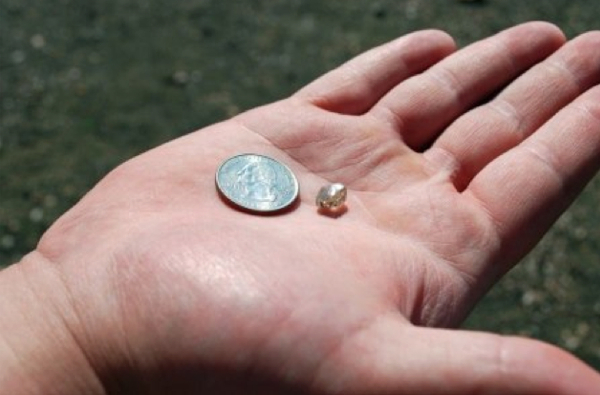 A lucky Louisiana man found a 2.89 carat white diamond stuck in a rock at Arkansas' Crater of Diamonds State Park in Murfreesboro, Arkansas, well-know for being a place where visitors tend to discover a wide range of precious gems. According to the park’s web site, 20-year-old construction worker Brandon Kalenda, a tourist from Louisiana, unearthed the diamond last Thursday, after searching the park for only 20 minutes. He named it "Jax Diamond" after his infant son Jaxson and is reportedly planning to keep it. Kalenda admitted that when he first found the diamond, which is worth around $20,000, he didn't even realize what it was. His Jax Diamond is the 47th diamond registered by a park visitor this year, and the fourth diamond weighing over a carat found at the location since the middle of February. Park Interpreter Margi Jenks said current conditions are "perfect" for diamond hunting at the park. "Diamonds are a bit heavy for their size, and they lack static electricity, so rainfall slides the dirt off diamonds that are on the surface of the search field leaving them exposed," she said. "When the sun comes out, they'll shine and be noticeable." More than 75,000 diamonds have been discovered at the properly named park since 1906, where visitors are allowed to keep their discoveries. The largest diamond ever found in the US, the 40.23-carat "Uncle Sam," was unearthed there in 1927.